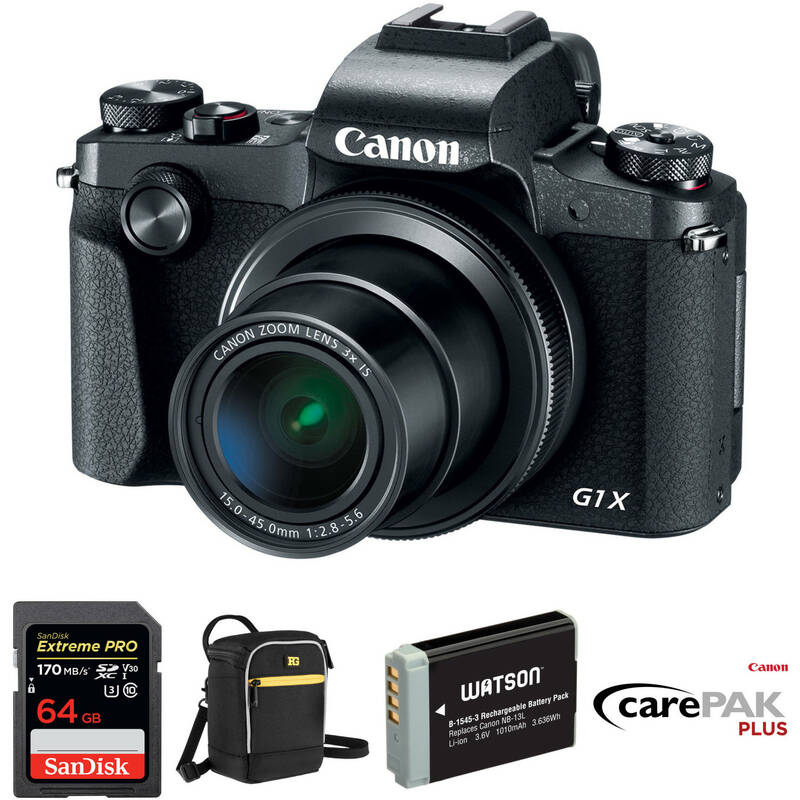 Comprising everything needed to begin shooting, the Canon PowerShot G1 X Mark III Digital Camera Deluxe Kit from B&H bundles the advanced compact camera with a memory card, a spare rechargeable lithium-ion battery, and a camera pouch. A two-year drops and spills warranty is also included for further protection to your equipment. Raising the imaging bar for Canon's series of advanced compact cameras once again, the PowerShot G1 X Mark III is distinguished by its larger sensor and versatile all-around imaging capabilities. A first for a PowerShot, the G1 X Mark III sports a 24.2MP APS-C CMOS sensor and a DIGIC 7 processor to realize notable image clarity, a wide sensitivity range from ISO 100-25600, an impressive continuous shooting rate up to 9 fps, and Full HD 1080p/60 video recording. The sensor's design also facilitates Dual Pixel CMOS AF, which offers quick and accurate phase-detection autofocus that benefits both stills and video applications. Balancing the improved sensor design is a versatile 3x zoom lens, which covers a 24-72mm equivalent focal length range to suit working in a variety of situations. An Optical Image Stabilizer is also featured, to minimize the appearance of camera shake for sharper imagery when shooting handheld. In addition to the updated sensor and processor capabilities, the G1 X Mark III also features a refined physical design complete with a built-in 2.36m-dot OLED electronic viewfinder and a 3.0" vari-angle touchscreen for easier, more intuitive control. Dedicated dials about the camera body afford direct adjustment of shooting settings and modes, and both a pop-up flash and a hot shoe are available. Additionally, built-in Wi-Fi with NFC and Bluetooth connectivity enable wireless pairing with a mobile device for remote live view shooting and image transferring. Both a 24.2MP APS-C CMOS sensor and DIGIC 7 image processor are used to deliver high sensitivity and fast camera performance to suit both stills and video applications. A flexible ISO 100-25600 range suits working in a variety of lighting conditions, and the processing capabilities minimize noise for notable clarity. The processor also contributes to a fast 7 fps continuous shooting rate, which can be quickened to 9 fps with AF lock, for photographing fast-moving subjects. Full HD 1080p video recording is also supported at up to a 60-fps frame rate. Dual Pixel CMOS AF offers smooth and fast focusing performance in a similar manner to how a camcorder acquires focus. This system integrates two separate photodiodes within each pixel to provide a broad and dense network of phase-detection gathering elements across a majority of the image sensor to reduce focus hunting for faster, more direct control of focus placement. When working with still imagery, this focusing system works to acquire focus quickly and accurately, making it ideally suited to shooting and tracking moving subjects so that critical focus is attained with each shot. When shooting video, a Movie Servo AF mode offers smooth and natural focusing when changing from different subjects or different distances within the scene, as well as the ability to specify tracking sensitivity, AF speed, and Face Tracking priority. Benefited by the Touch AF system, rack focus is possible simply by touching elements within the scene on the touchscreen in order to change focus in an intuitive manner. Subject tracking in movies is also heightened due to the Dual Pixel CMOS AF system's ability to recognize subjects and maintain focus when working within changing or cluttered scenery. A built-in 3x zoom lens offers a versatile 24-72mm equivalent focal length range, covering a wide-angle to portrait-length reach. This f/2.8-5.6 lens also incorporates a Dual Sensing Optical Image Stabilizer system to minimize the appearance of camera shake by up to four stops for sharper handheld shooting. Integrated 2.36m-dot OLED electronic viewfinder offers a bright, clear eye-level means for composing imagery. Rear 3.0" touchscreen is also available for intuitive playback, menu navigation, and live view shooting, and its vari-angle design benefits working from high and low angles. When working with the electronic viewfinder, Touch and Drag AF lets you manually move the AF point selection using the rear touchscreen while keeping your eye to the finder. Physical controls allow for intuitive settings adjustments, and include a front dial, an exposure compensation dial, and a top mode dial, as well as dedicated rear buttons and dials. Built-in pop-up flash can be used for additional illumination and a hot shoe is also featured for working with an optional external flash or other shoe-mounted accessory. The body has a dust- and moisture-resistant physical design to permit its use in trying environmental conditions. Shooting Modes: Smart Auto (58 scenes detected), Hybrid Auto, Program AE, Shutter priority AE, Aperture priority AE, Manual, Custom 1, Custom 2, SCN (Self-Portrait, Portrait, Smooth Skin, Panoramic Shot, Panning, Star (Star Nightscape, Star Trails, Star Time-Lapse Movie), Handheld Night Scene, Grainy B/W, Soft Focus, Fish-Eye effect, Art Bold effect, Water Painting effect, Toy Camera effect, Miniature effect, HDR, Underwater, Fireworks), and Movie (Standard, Short Clip, Manual, Time-Lapse Movie). Photo Effects: Auto, Standard, Portrait, Landscape, Fine Detail, Neutral, Faithful, Monochrome, and User Defined. Language Support: English, German, French, Dutch, Danish, Finnish, Italian, Greek, Norwegian, Portuguese, Russian, Swedish, Spanish, Ukrainian, Polish, Czech, Hungarian, Turkish, Simplified Chinese, Chinese (traditional), Japanese, Korean, Thai, Arabic, Romanian, Farsi, Hindi, Malay, Indonesian, Vietnamese, and Hebrew. Built to meet the demands of photographers and passionate shutterbugs who are using advanced cameras and HD camcorders, the 32GB Extreme UHS-I SDHC Memory Card from SanDisk allows users to take advantage of functions such as fast action shots, continuous burst mode, and multiple frames per second. It features a capacity of 32GB, is compatible with the UHS-I bus, and delivers maximum read speeds of up to 90 MB/s and maximum write speeds of up to 40 MB/s. This Extreme UHS-I SDHC card supports the V30 speed class, which guarantees minimum write speeds of 30 MB/s. If your device does not support the V30 speed class, this card also supports the U3 speed class, which likewise guarantees minimum write speeds of 30 MB/s. If your device only supports the Class 10 standard, minimum write speeds are guaranteed not to drop below 10 MB/s. Built for extreme conditions, SanDisk's 32GB Extreme UHS-I SDHC Memory Card is water, shock, and x-ray proof, while also being able to withstand temperatures from -13 to 185°F, allowing for use in environments such as snow and deserts. A built-in write protect switch further helps to safeguard your content, while advanced Error Correction Code engine offers improved data integrity and card reliability during read and write operations. Downloadable RescuePRO data recovery software helps you restore accidentally deleted images. The card also has a writable label on its surface and the included jewel case makes for easy storage and organization. This card is backed by a limited lifetime warranty. With write speeds up to 40 MB/s, this card unleashes the full shooting potential of your advanced camera or DSLR. Take advantage of advanced functions such as fast action shots, continuous burst mode, and multiple frames per second. Photos are written to your card almost instantly so you'll get your best shot, and you'll save time moving it all from your camera to your computer. With a capacity of 32GB to capture it all, this SanDisk Extreme UHS-I Card offers enough room for thousands of high-resolution photos. The card can accommodate high-volume image formats, such as RAW and JPEG, and also provides plenty of room for Full HD videos. With Class 10, UHS Speed Class 3 (U3), and V30 video ratings, you'll be ready to capture 4K Ultra HD, cinema quality 3D, and Full HD video (1080p), which require more performance than ordinary cards can handle. This memory card's accelerated minimum sustained write speeds help ensure that video data isn't lost during recording, by reducing dropouts and stuttering. Thanks to its Advanced Error Correction Code engine, this SanDisk Extreme UHS-I SDHC card helps reduce the chance for errors during data storage and retrieval. It prevents potential data corruption, providing high data integrity. SanDisk Extreme UHS-I SDHC cards boast a read speed of up to 90 MB/s, so you can transfer photos and videos to your computer quickly. You'll spend less time uploading photos and more time editing, storing, and sharing. Designed and tested to withstand the tough conditions, this card has a capacity of 32GB and is waterproof, shockproof, and X-ray proof. It can operate in temperatures ranging from -13 to 185°F, so you can work in almost any climate. SanDisk RescuePRO and RescuePRO Deluxe software are file and data recovery products for recovering deleted files from all types of digital media. Store, transport and protect your digital mirrorless or bridge camera from moisture, dirt and dust with the black Lyra 60 Camera Pouch from Ruggard. The pouch features an easy access, zippered, clamshell opening, and an interior SD memory card pocket. Soft, padded, interior nylon helps protect your camera from impact, scratches and abrasion. This protection is complemented by a weather-resistant nylon exterior. Carry the pouch with the top grab handle, handy belt loop with touch-fasten tabs, or with the removable shoulder strap. The bright yellow interior makes it easier to locate stored items in low light. With the Watson NB-13L V2 Lithium-Ion Battery Pack, you can power any camera that runs on the Canon NB-13L. This replacement battery improves on the previous version by adding compatibility with the Powershot G9 X Mark II. It features a 1010mAh capacity, 3.6V of output power, and a 3.636Wh energy consumption rate. Small and lightweight, lithium-ion batteries can be charged or discharged at any time without developing memory effect. Box Dimensions (LxWxH) 6.3 x 5.7 x 4.2"
Box Dimensions (LxWxH) 2.598 x 2.047 x 0.63"
Box Dimensions (LxWxH) 5.5 x 3.1 x 0.6"